If you haven’t checked out all the benefits of purchasing an Amazon Prime Membership, you can see them all here and get your free trial if you haven’t done so already. Ends 10/5/2015 GOOD LUCK Everyone!!! I will buy Vermont Maple Syrup for my winter pancake breakfasts ! I would buy some cleaning supplies, shampoo, conditioner, razors and stuff like that. I’d buy some christmas toys or books! I would buy my mom a birthday gift. Some art supplies for me and the kids. I would put it towards a new monitor. The TV I am using is low res. This would go a long way towards Christmas gifts! I would get the Dr. Dennis Gross Alpha Beta Peel. 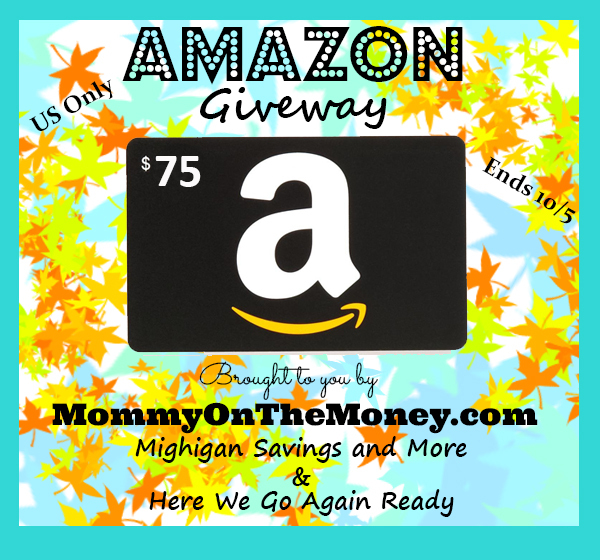 If I would win $75 dollar Amazon card I would put it back for things like diapers for our baby to be! I’m so excited! Thanks for the give away! This money will go toward Christmas gifts. Money is tight this year. So this will really help! I would like to buy some new towels for kitchen and bath. I’d like to buy books. I’d like to buy some grassfed ghee. I would get some Vitamin C serum and some essential oils that I need for Christmas presents I want to make this year. I would get movies and books. Thanks! I would use it toward some Nerf guns my son wants. I would buy things for our future baby with the Amazon gift card! I want to win because I am constantly buying books for myself and other gifts for friends and family members. I love Prime and cannot remember what life was like before it! I was able to send my niece a set of Dinosaur cookie cutters in time for her son’s first birthday party when she could not find them in any local stores. I grew up building complex buildings and cars with Legos with my brother and now my nephew LOVES legos. I like to make Lego creations along with my grandchildren. I would get books we want for homeschooling. Legos have been in our life in one form or another for over 40 years! I would buy hand warmers on Amazon for the cooler weather. My daughters have been collecting Legos since they were small. It is one activity we can all enjoy. I like Legos because they encourage imaginative play. I would get birthday gifts for my niece and nephew. My nephew loves Legos! I got him a huge Lego Star Wars kit for Christmas and he thought I was the best uncle ever. The kids are in love with legos. It seems they cannot get enough legos. My grandson loves to build and play with lego’s. My kids love playing with Lego’s and my Lego secret is that I still enjoy building with them too.